Care of older people is often referred to as a ‘Cinderella’ service and is not seen as an attractive career option in health care, but with the global population continuing to age, caring for this group will become increasingly important. 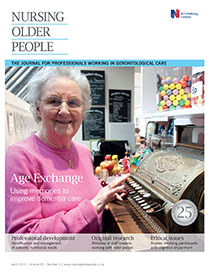 This article outlines the literature that formed the basis for two studies investigating the attitudes of healthcare staff towards working with older people, including respondents’ perceptions of other healthcare professionals’ attitudes toward this important area of work. The Multifactorial Attitudes Questionnaire was designed to examine five major themes identified from the literature: ageism; learning environment; working environment; professional esteem; and specialist status. This study is presented in two parts: this article discusses the literature and the design of the questionnaire. The second article, to be published in a subsequent issue of the journal, presents the results from two studies done in Scotland, the first in 1999, with a replication study in 2009.